I came across some plastic light bulb containers while shopping at a craft store for my daughters room redo. I thought they were the cutest thing… and were PERFECT for the “You Light Up My World” Valentine I had been brainstorming! I grabbed up 10 for $1 each (and then used a coupon of course!). I tried filling them with Lemon Drops, but the mouth of the container was too small. DOH! Then I decided to try Reeses Pieces… and took one for the team by eating all the browns. I then filled the light bulbs up with those – except there was more orange then anything else and I didn’t have enough yellow to fill one all the way. Then I remembered the package of Baby Goldfish we had in our cupboard, so I grabbed those and VOILA! They were perfect. Of course, the contents don’t HAVE to be yellow, but for the purpose of pictures… I WANTED it to be! 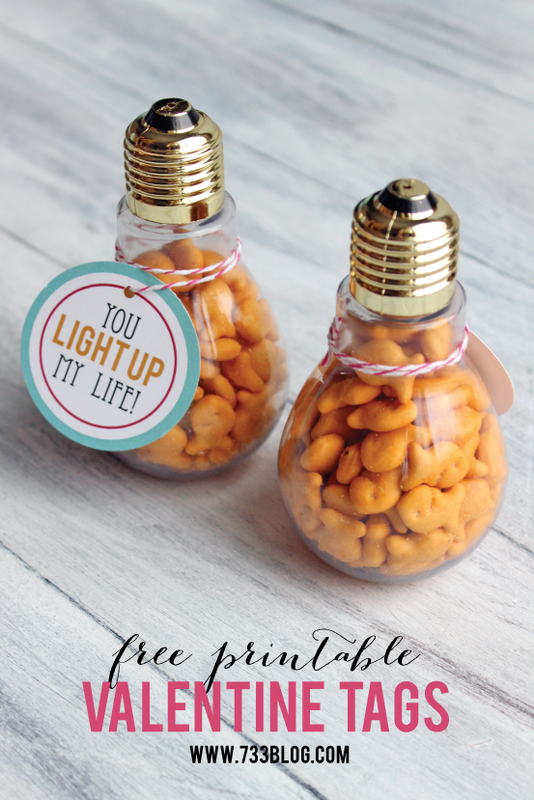 All the kiddos at daycare will be receiving these Goldfish Light Bulb Valentines from my kids this year. 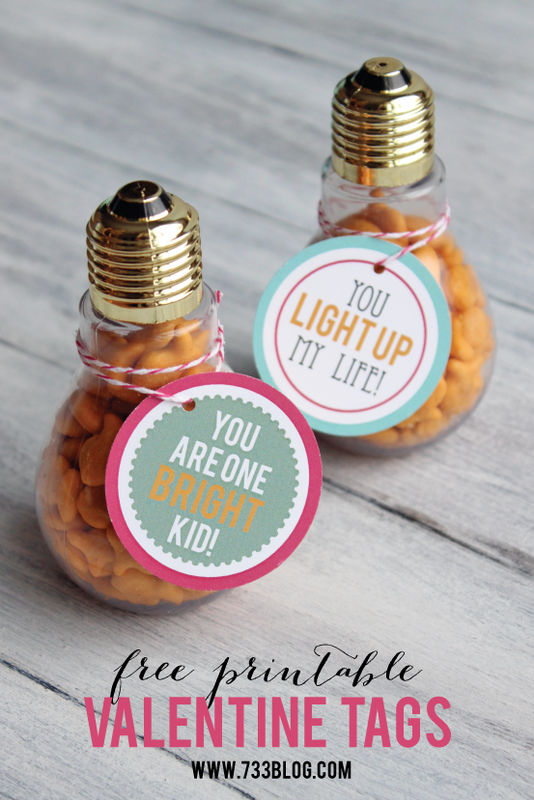 Download the You Light Up My Life and You are One Bright Kid Valentine Tags. Personal use only. Do not alter. I used my 2″ hole punch to cut the tags out and tied to the bulb with baker’s twine. those light bulb containers are genius!! What a great idea! Pinned it! Aren’t they fun Emily? I was pretty excited when I saw them! Super cute! I’ve been looking for some containers like these, which craft store did you find them at?